Chinese porcelain had been admired in Europe since before 14th century. 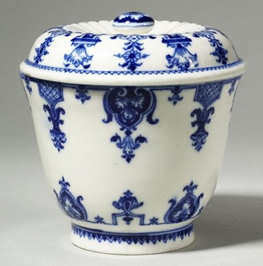 As trade with the Orient grew during the 1600’s, porcelain became popular with the general public. The custom of drinking tea, coffee, and chocolate became widespread and created a huge demand for porcelain cups and saucers. European manufacturers responded by trying to make hard-paste porcelain themselves, but for a long time they failed to discover the secret. Its translucency suggested that glass might be an ingredient, and many experiments combined clay with powdered glass (frit). The resulting experimentation resulted in beautiful soft-paste porcelain. The first European soft-paste porcelain was produced in Florence, Italy, about 1575. By the 1700’s, porcelain manufactured in many parts of Europe was starting to compete with Chinese porcelain. France, Germany, Italy, and England became the major centers for European porcelain production. By the late 17th and early 18th Century France became the leading producer of soft-paste porcelain. Experiments at Rouen produced the earliest soft-paste in France, when a 1673 patent was granted to Louis Poterat, but it seems that not much was made. An application for the renewal of the patent in 1694 stated, “the secret was very little used, the petitioners devoting themselves rather to faience-making”. Rouen porcelain, which is blue painted, is rare and difficult to identify. A soft-paste porcelain was established by Louis Henry, Duc de Bourbon on the grounds of his château in Chantilly around 1730. The Duke had a large collection of Japanese Porcelain which inspired much of the Chantilly’s early output. Early wares have an opaque tin glaze, giving a flatter look than St Cloud. Some of the Chantilly wares directly copy Japanese pieces, while others are executed in a style reminiscent of Japanese porcelain. Pictured left: A Mennecy Pommade Pot And Cover And A Saint-Cloud Pommade Pot. Another soft-paste factory was opened at Mennecy by François Barbin around 1750. The French factory of Mennecy had its roots in a small ceramic enterprise in the town of Villeroy around 1734. The first factory failed financially and was re-opened in nearby Mennecy in 1750. The production of the Mennecy factory remained modest in terms of both scale and ambition, despite the patronage of the duc de Villeroy, but it produced utilitarian ware of considerable originality and somewhat naive charm The Mennecy factory closed in 1773. 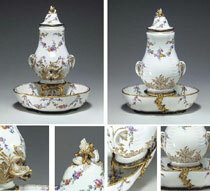 The most celebrated type of soft-paste porcelain was first produced at Vincennes in about 1740. It was to dominate not only the French ceramic industry, but also the entirety of European ceramics for the second half of the eighteenth century. The Vincennes porcelain factory was established in 1740 under the supervision of Claude-Humbert Gérin, who had previously been employed at Chantilly. 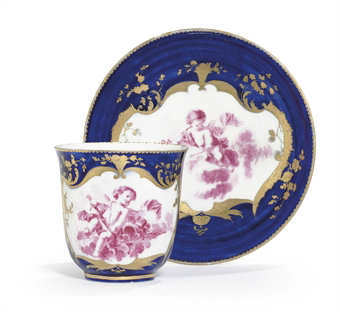 Pictured right: A Vincennes Bleu Lapis Cup And Saucer 1753-1754, sold for $2375 at Christies, New York in May 2008. The factory quickly developed a superior soft-paste porcelain body that was whiter and freer of imperfections than any of its French rivals. It also hired the most talented French artists to design shapes and provide drawings and prints for the factory’s painters. The Vincennes factory attracted the attention of Louis XV, who not only provided financial backing, but also purchased the first dinner service the factory produced. The king became the sole owner of the factory in 1759, three years after it had moved to larger quarters in Sèvres, located to the west of Paris. The Sèvres factory flourished because of its constant innovation; new forms were always in development, sometimes pushing the established boundaries of porcelain. Pictured left: A Sevres Beau Bleu Dejeuner c1780, sold for $6000 at Christies, New York in May 2008. The earliest Sevres had graceful shapes and soft colors. Sevres pieces produced from 1750 to 1770 were decorated with brilliant colors and heavy gilding. Many of these pieces had richly colored backgrounds and white panels painted with birds, flowers, landscapes, or people. Sevres is also noted for its fine figurines of biscuit (unglazed porcelain). 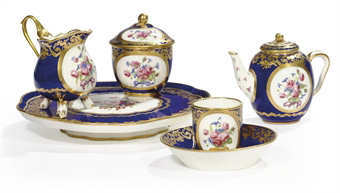 The Sevres factory introduced hard-paste porcelain in the 1770s and soft-paste porcelain production ended in 1804. 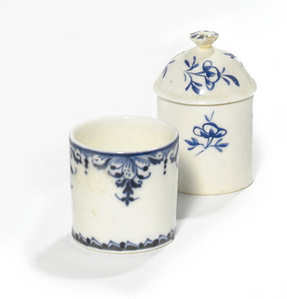 Beginning in 1771, a hard-paste porcelain industry developed near Limoges, where kaolin deposits had been discovered. By the 1800’s, Limoges had become one of the largest porcelain centers in Europe. An American named David Haviland opened a porcelain factory at Limoges in 1842 to make tableware for the American market. Haviland porcelain features soft colors that blend together and small floral patterns.